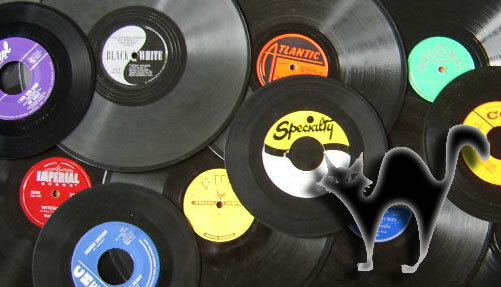 Prowlin' With Matt The Cat » Blog Archive » The “Good Rockin’ Tonight” Cat Fight Podcast! The “Good Rockin’ Tonight” Cat Fight Podcast! The Friday Night Cat Fight presents “Good Rockin’ Tonight,” one of the most important and influential songs every recorded. Three versions are in contention with week, with the tune’s author, Roy Brown leading the pack with his original version from 1947. Wynonie “Mr. Blues” Harris and Elvis Presley also take a shot at the song. Wyonie’s went to #1 on the R&B lists in 1948 and Elvis’ version helped to spark the “Rock n’ Roll Revolution” of the mid-1950s. Click Here To Listen to the Cat Fight Podcast. This blog is dedicated to the preservation of the world's greatest music: 1940s-70s Rhythm & Blues and Rock n' Roll. When I'm not collecting records, I'm listening to them. Cat Fight "Alley Of Fame"